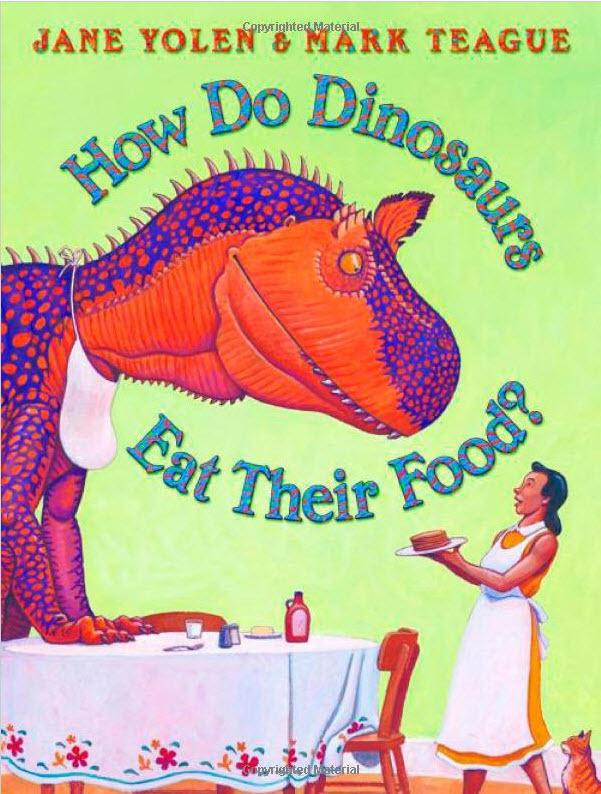 Perfect Picture Book Friday: How Do Dinosaurs Eat Their Food? It’s Perfect Picture Book Friday— one of my favorite times of the week! Today I am a bit late because the last few days have been ridiculously busy with too many things. And today is Ian’s school “fun run” where the kids raise money by being sponsored to run 30 laps around their field track. I volunteered to check off laps for each child (fun! ), but before that I have to finish sorting books in Ian’s classroom. And AFTER the run, I have school library duty! I won’t be done until Ian gets off the bus. Then he’s got soccer practice and a tennis event tonight. No time to write! or make noises quite rude? The first half of …Eat Their Food is all about the “questions” (as shown above in the opening lines). These questions ask how a dinosaur might misbehave at the dinner table… in all different ways (“does he bubble his milk? stick beans up his nose?”) Each question is accompanied by an illustration of the dinosaur doing the dirty deed. Then the second half of the book ANSWERS the questions and basically says “No!” In other words, the dinosaurs do NOT do all of these terribly ill-mannered things… instead they say “please and thank you” and eat “all before him with smiles and good will.” And on and on. So the good behavior counters the bad. Why I like this book: This is one of my favorites of the series. They’re all done with humor, but something about dinosaurs having bad table manners makes me chuckle inside. The illustrations are colorful and depict goofy dinosaurs in various human-like (child-like) poses. The cadence of the writing and the rhyme is fun to read, both outloud and to yourself. Best of all, there’s a message that goes along with the humor– that is, if dinosaurs can have good table manners, so can YOU, dear child. Resources/links: Jane Yolen’s web site. And here’s a quick little article on teaching your child good table manners. Check out all the Perfect Picture Book picks on Susanna Leonard Hill’s blog, here.